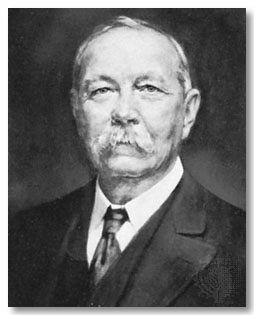 Sir Arthur Conan Doyle, author of the Sherlock Holmes mysteries was the model for his own character "Dr. Watson." He dedicated his medical skills to the army during the South African (Boer) War. He wrote the first edition of "The Great Boer War" in 1900, later updating it to cover the war to its end in 1902. In the Preface to the First Edition, he wrote: "This book was begun in England and continued on board a steamer, but the greater part was written in a hospital tent in the intervals during the epidemic at Bloemfontein." My private informants are so numerous that it would be hardly possible, even if it were desirable, that I should quote their name~. of the correspondents upon whose work I have drawn for my materials, I would acknowledge my obligations to Messrs. Burleigh, Nevinson, Battersby, Stuart, Amery, Atkins, Baillie, Kinneir, Churchill, James, Ralph, Barnes, Maxwell, Pearce, Hamilton, and others. Especially I would mention the gentleman who represented the `Standard' in the last year of the war, whose accounts of Vlakfontein, Von Donop's Convoy, and Tweebosch were the only reliable ones which reached the public. IT is possible that a fuller knowledge may give an entirely different meaning to some of the events of the Boer war. This account is compiled with as much accuracy as is attainable at this date, and with as much detail as a single volume will permit. The occasional judgments and criticisms on which I have ventured may be founded upon error, but at least they are made without either fear or favour. In frequent conversations with Boers I have endeavoured to get their views upon both political and military questions. The book was begun in England and continued on board a steamer, but the greater part was written in a hospital tent in the intervals of duty during the epidemic at Bloemfontein. often the only documents which I had to consult were the convalescent officers and men who were under our care. Under these circumstances some errors may have crept in, but on the other hand I have had the inestimable advantage of visiting the scene of this great drama, of meeting many of the chief actors in it, and of seeing with my own eyes something of the actual operations. There are many who have helped me in my task, but I especially acknowledge the co-operation of Mr. Blasson, of the Langman Hospital, now dead in the service of his country, and of Mr. Charles Terry, of Haslemere, who collected and arranged my material. Chapter XXXII: The Second Invasion of Cape Colony. Arthur Conan Doyle, The Great Boer War.